State Sen. Rich Madaleno today gleefully tweeted the results of the United for Maryland Democratic gubernatorial forum poll. Six of the eight Democratic gubernatorial candidates participated, including Prince George’s County Executive Rushern Baker, former NAACP president Ben Jealous, Baltimore County Executive Kevin Kamenetz, state Sen. Rich Madaleno, tech entrepreneur and former Obama official Alec Ross and former policy director under Michelle Obama and State Department official Krishanti Vignarajah. Dr. Maya Rockeymoore Cummings – who entered the Democratic primary earlier this month – and Jim Shea were unable to attend the forum due to previous engagements. Nearly 300 people attended the forum. Poll results were released today. So, what to make of the results? Alec Ross and Krishanti Vignarajah’s poll numbers increased between the pre-ballot and post-ballot – but only marginally. Both candidates had strong forum performances but still, both candidates have significant ground to cover with Democratic primary voters, mostly because they are virtually unknown. Nevertheless, Vignarajah and Ross have each hired top-notch campaign teams and are making their way around the state, working the Democratic circuit and meeting as many voters as they can. It’s quite apparent that Ross and Vignarajah are virtually impossible to dislike on a human level. You cannot discount that even the most academic and policy-driven voters can and will sometimes vote viscerally, especially when a candidate on a ballot inspires intense dislike among the general populace (see Kevin Kamenetz). Admittedly, I’m shocked by Prince George’s County Executive Rushern Baker’s poor showing in the data. He’s the county executive of a large, adjacent county and is well-known in Democratic circles. A recent Goucher poll even showed Baker prohibitively leading the candidate pack. Baker had a solid forum performance that day. So what gives? He certainly doesn’t have a likeability problem; he’s one of the nicest guys in Maryland politics, according to, like, everybody. Baker is about as establishment politics as they come, a characterization I would think he’d embrace considering that Maryland Democratic primary voters typically support establishment politicians in gubernatorial and presidential elections (e.g., Anthony Brown, Hillary Clinton, Martin O’Malley, William Donald Schaefer). Most of the Maryland Democrats that I’ve spoken with still, though, concede that Baker will win the Democratic nomination. While state Sen. Rich Madaleno (District 18) is happily waving the forum’s poll results in the faces of Democratic primary voters, context is nonetheless crucial to understand the results. The forum was held in Montgomery County on Madaleno’s home turf, and Madaleno’s campaign turned out an impressive crew of supporters to cheer on their hometown budget wonk preceding the start of the event. The forum’s location undoubtedly helped bump up Madaleno’s poll numbers. If the forum was held in, say, Hagerstown or Salisbury, we would be analyzing an entirely different data set. 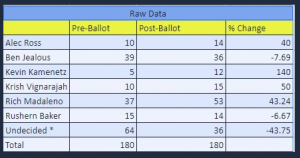 Even so, the delta between Madaleno’s pre-ballot and post-ballot numbers is worth an honorable mention. Clearly, a swath of the forum attendees was inspired by Madaleo’s debate performance. Grow some thicker skin. Proverbially, Rich can dish it out but he seemingly cannot endure even gentle criticisms. It’s a well-known fact that Rich, who is a hell of a nice guy, is incredibly thin-skinned. That’s sometimes hard to overcome. Prove to voters that Ben Jealous isn’t the most progressive candidate in the race while simultaneously exposing Jealous as the inexperienced political celebrity who talks the talk but hasn’t really walked the walk. How many applause lines does Jealous have left after telling the story that he hung out with Bernie Sanders on the 2016 campaign trail? So, what to make of Ben Jealous? Discounting undecided pre-balloters, Jealous – who has virtually no base in Montgomery County – obliterated two regional county executives. Baker and Kamenetz have established voter bases and are well-known throughout Maryland politics as reliable Democrats. And forum voters rejected them handily. Can Jealous call himself the progressive knight of Maryland politics without a single legislative accomplishment to his name? That’s going to be hard for him to explain to seasoned primary voters who crave fresh and exciting but also value experience and who will ultimately reward Maryland loyalty. It’s worth mentioning that Madaleno only trailed Jealous by two votes in the pre-ballot and then gained significantly on the former head of the NAACP in the post-ballot. And, yet, Jealous actually dropped in support in the post-ballot. Did Jealous have a bad performance that day? Or did Madaleno woo voters to his message? Hence the reason you’ll see Madaleno ramping up his political attacks on Jealous more as the race progresses. Jealous and Madaleno are competing for the same pool of staunchly progressive votes, and current polls show that Jealous only slightly outflanks Madaleno among Democratic primary voters in Maryland. Question: Between Jealous and Madaleno, who is most progressive? Madaleno has a legislative record to point to while Jealous ballyhoos over joining Bernie Sanders’ side on the presidential campaign. Madaleno is a rough-and-tumble policy wonk; he’s been in Maryland’s progressive trenches for years and can point to legislative accomplishment after accomplishment without too much ego. But Jealous has star political power behind him – Bernie Sanders, Cory Booker, Dave Chappelle, the SEIU – while Madaleno is still seen as the somewhat audacious Annapolis budget savant and former staffer. Ask Rich Madaleno’s Senate colleagues if they truly can picture calling him Governor Madaleno. But does political and celebrity power really matter in Maryland? Maybe. Maybe not. Ask Martin O’Malley. The former Democratic governor spent years trying to build his national brand. He spent a lot of his remaining years as governor hanging out with big-name politicos – and for what? O’Malley’s 2016 presidential campaign is nothing more than an asterisk in the history books. Madaleno has what Jealous wants: A dozen or more years of building relationships inside Maryland political circles. Jealous hasn’t cultivated nearly as many relationships as Madaleno. Few state legislators are backing Jealous’ bid, while Madaleno, at least on the surface, has put together a broad coalition of Democratic insider support, including Raskin’s below-the-beltway base (which comfortably rests inside of Madaleno’s state senate district) as well as several other Montgomery County Democratic insiders and elected County officials. Bottom line: Which Democrat can raise enough money, assemble the broadest coalition of Democratic supporters and drive up enough voter turnout to succeed Larry Hogan as the state’s 63rd governor of Maryland. Where is this primary heading? Will the Democrats lean toward a progressive rockstar like Ben Jealous? His fate is uncertain in a general election against Larry Hogan. Maryland Democrats are known to gripe about Jealous not putting in the requisite legwork among Party loyalists and insiders. Even more, some Democrats are accusing Jealous of using Maryland as a launching pad for a national campaign in waiting. Will the race boil down to all the rest of the candidates versus Ben Jealous? Some smart people think so. Will Maryland Democrats run a conventionally safe campaign, choosing a well-known county executive or popular progressive state senator? Or is this the year to go with the wildcard? Remember that Maryland Democrats chose the “safe” choice in 2014 and Larry Hogan was the end result. Of course, other variables contributed to Brown’s stinging loss, but Democrats mostly still blame Brown for running a dreadfully pitiful campaign. Where does Jim Shea and Dr. Maya Rockeymoore-Cummings fall into this race? It’s hard to tell. Maybe Rockeymoore-Cummings will become the wildcard of the bunch. I don’t know enough about her yet to make an accurate prediction. Baltimore County Executive Kevin Kamenetz really shouldn’t be considered a top-tier candidate at this point. You don’t believe me? Look at the poll results above. Maryland Democratic primary voters appear to be less and less enthralled with Kamenetz the more they get to know him. I’ve heard Democrats describe Kamenetz as sleazy, egotistical, slimy, unlikeable, untrustworthy, no charisma, shifty, and the list goes on. That’s just from the Democrats. It’s not nice, but honesty wins the day. Finally, does any of this matter ‘right’ now? The race is still in its infancy. Candidates haven’t begun their mailing campaigns. And none of the candidates have announced their lieutenant governor picks. None of the candidates have pulled a David Trone… yet – drop a big lump of money and hope for the best.